This recipe is a lighter version of a Pichet Ong dessert. Using frozen mango chunks cuts down on time, expense, and effort, and the flavor is pretty much the same as with fresh mango. 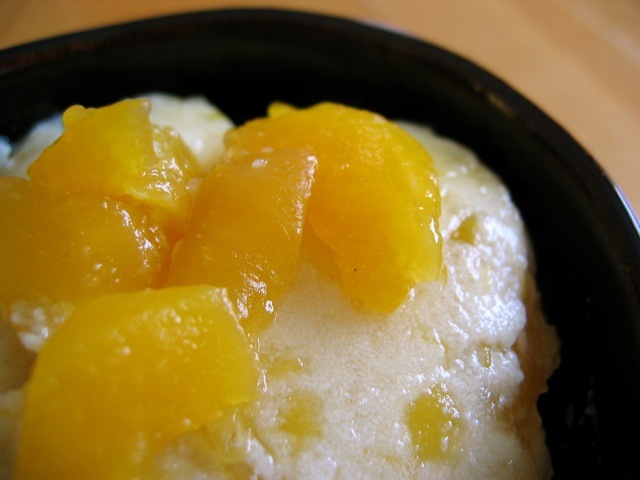 If you want to make the silky-smooth mango pudding served in dim sum restaurants, try adding mango purée to Panna Cotta (Cooked Cream). This coconutty version is a chunkier, Southeast Asian riff on the dim sum classic. While the mango is cooking, put the 3 tablespoons cold water into a bowl and scatter the powdered gelatin over it; stir thoroughly, until the gelatin has dissolved. Let sit for about 3 minutes, thickening, then scrape into the mango mixture. Stir thoroughly and simmer on low for about 5 minutes, stirring occasionally. Stir the coconut milk and milk into the mango mixture; cook, stirring, for a few minutes. Pour the pudding into ½-cup-size dessert cups or into a large serving bowl. Chill for several hours, preferably overnight, until set. Serve cold, topped with whipped cream or shredded coconut if you like.